Anxiety is a condition where a person suffers from constant fears or worries for a particular or unwanted reason. Anxiety can be a symptom as well as a generalised disorder affecting quality of life of an individual. There can be different forms like random panic attacks, different types of stress disorders, phobias and social anxieties. Anxiety may come with a range of symptoms which can be physical or psychological. Symptoms can range from palpitations, nausea, cold, short breath, sleeplessness, unwanted fears, fatigue, muscle cramps and pains. For panic attacks the pain will be unusually strong with palpitations. During social anxieties a person will feel being judged or commented by others, he may feel embarrassed resulting in devastating worries. In case of phobias one may feel fear or anxiety towards very normal situations in life like fear towards water, fear to light, fear towards heights etc. All these can arise in everyday life so that a person feels totally distressed. The causative factors of these anxieties can be due to genetic and environmental factors. 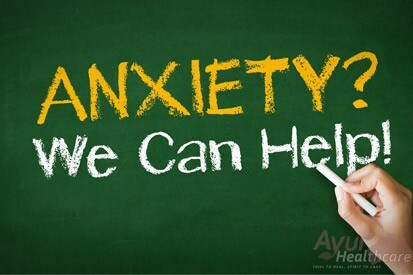 The anxiety disorders can arise in early adulthood so early screening and rehabilitative techniques which are so personalized in Ayur care will help you in resolving the condition for a better lifetime. Ayur Healthcare’sexperts deal with anxieties through specialized herbal care programs. The Ayur Healthcare special thalam, Talapotichil and Sirodhara are particularly formulated to combat these conditions with all its perfections. The treatments can be of 5 days, 7days or 14 days depending upon the severity of the condition. These treatments help in the proper and controlled release of the chemicals from the brain like serotonin, dopamine and noradrenaline, which controls and regulates the mood and help in healthy conduction of nerves and impulses. Proper conduction of the impulses is necessary for the healthy functioning of the brain systems. People with additional systemic disorders may find sheer difficulty in coping up with the situation. This is the area where Ayurcare comes with the helping hands. Ayur Healthcare’s Sirodhara: It is the procedure of slow dripping of medicated herbal oils in the forehead by experienced therapists. The herbal medicines processed in buttermilk, milk, decoctions or oils can be used for Sirodhara. The vessels used for the Dhara are exclusively made out of special metals like copper which help in healing. The statistics on the studies of Sirodhara based on stress and mood levels, electrocardiogram (ECG), electroencephalogram (EEG) showed a good reduction in the anxiety and stress levels .The medicines and herbs differ from person to person and depend upon different conditions. A tranquilizing effect was noticed in the cerebral cortex after the Sirodhara therapies. All these brain and neuronal functions are based on Vata. Ayur Healthcare’s Abhyanga (massaging the body or head with different herbal oils) as a preparative procedure will give an additional benefit to the person suffering from anxiety disorders. It helps in inducing relaxation responses.Studies have showed the increased influence of Abhyanga on the decrease in remission rates on the episodes of anxiety disorders. Ayur cares Abhyanga follows a more affordable therapeutic style with a variety of herbal oils ensuring appealing and relaxing benefits. Ayur Healthcare’s Thalam: Thalamis a highly effective thearputical treatment procedure which is performed on the vertex of the head, at a place in the center of the scalp. Depending upon the predominance of Dosha in the disease as diagnosed by the expert practitioner , thalam is prepared out of different herbal plants and their extracts. Milk, oil, decoctions, ghee and buttermilk is used as a variety of medium for thalam along with medicated herbal powders considering the disease condition. Ayur Healthcare’s Talapotichil: Talapotichil is a Kerala special treatment procedure where a head band is tied over the fore head and a special herbal paste is made out of herbal powders and medicinal plants and this special preparation is applied on to the patients head and is retained for a specific period of time. This special treatment is highly effective in the case of vatika disorders affecting the mind and brain. Panchakarma for anxiety disorders: Panchakarma is the cornerstone of Ayurveda while treating all major ailments. Panchakarma comprises a preparatory procedure and Main course of procedures like vamana, Virechana, vasthi, Nasya and Rakta moksha .All these treatment modalities are highly effective in the case of treatment of anxiety disorders. Especially vamana or emesis is highly effective in Kapha related anxiety disorder where the toxins are vomited out of the body through the process of drinking herbal preparations as medicines. Virechana is effective in Pittaja disorders and vasti is very useful in Vata related disorders. Nasya will help in the proper stimulation and relaxation of brain functions through the medicines applied through nostrils. All these therapies are done after proper preparatory procedures like snehana (oleation) and Swedana (fomentation). Master your mind through Ayur Healthcare !! !